Aristotle was one of the most influential Greek philosophers of the ancient world, and his work along with that of Socrates and Plato forms the basis of modern philosophy. He wrote on many subjects such as physics, metaphysics, poetry, logic, rhetoric, politics, government, and ethics. Physics is one of Aristotle's major works. A collection of lessons, the book covers theoretical, methodological, and philosophical issues of the ideas of motion and change in nature. FCIT. "Aristotle author page." Lit2Go ETC. Web. 18 April 2019. <https://etc.usf.edu/lit2go/authors/16/aristotle/>. 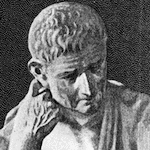 FCIT, "Aristotle author page." Accessed April 18, 2019. https://etc.usf.edu/lit2go/authors/16/aristotle/.